According to the Intergovernmental Panel on Climate Change (IPCC) 2001 report on Mitigation and the PEW Center on Global Climate Change, Agriculture contributes to approximately 20% of global anthropogenic greenhouse gas emissions. AgCert™ reduces greenhouse gas emissions on livestock farms by implementing practice changes in Animal Waste Management Systems. Agricultural producers gain a new revenue stream that result from the sale of the emission reduction. Additional benefits include reduced odour, improved fertiliser, preventing contamination of groundwater or surface water, and reduced flies. Due to AgCert's activities on one farm, regulators that had previously closed the farm due to environmental issues allowed it to reopen. Emission reductions (ERs) are created by a difference in the amount of emissions from a defined baseline. Specifically, ERs are created by improved manure handling practices such as covering a lagoon or earthen basin with a biocover or non-permeable cover, or the use of deep pit confinement buildings, or anaerobic digesters. These practices reduce the amount of methane and nitrous oxide that would normally be produced in the baseline environment. The ERs that can be marketed by this ISO standardized process are calculated by complex algorithms, unprecedented transparency of data, and rigorous quality control and verification. AgCert™ aggregates ER supply not only from multiple farms, but multiple farm systems, and manages the verification, registration and liability issues. This simplifies the process for livestock producers, who ultimately reduce their risk to zero, provided they verifiably adhere to the practices that result in emission reductions. The multiple farm system aggregation process also simplifies transactions for buyers, as they are able to confidently purchase large quantities of ERs from a single seller (AgCert™). One example of an improved animal waste management system would be an anaerobic digester. 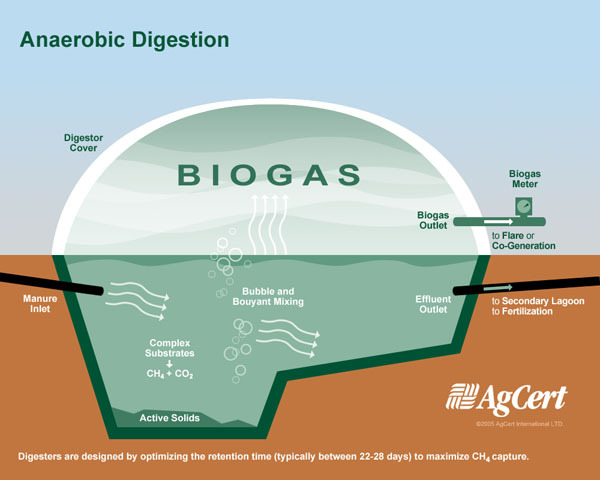 A cross section of a digester like the one shown in the above picture appears below. Digesters are designed by optimizing the retention time (typically between 22-28 days) to maximize CH4 capture.